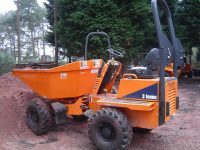 We supply 4 wheel drive dumpers for use with our piling rigs and accessories. Mini Piling Plant Hire stock a wide range of 4 wheel drive high lift skip loading dumpers from 1 tonne to 10 tonne machines, along with towing pins, trailer boards, flashing beacons and other accessories for delivery or collection nationwide. At Mini Piling Plant Hire we also supply a broad range of piling rigs and grundomat piling hammers suitable for all types of project and any required accessories at extremely competitive hire rates throughout the UK.